Are you out at work all day and dread coming home to see what destruction awaits you? Has your dog dug a hole in the yard again? Do you ever think to yourself, what has my dog chewed up this time? Feeling guilty that you have left your best friend at home all day alone? A walked, tired dog is a happy dog, a tired dog is a less destructive dog and you get to go to work without feeling guilty! We offer affordable Gold Coast wide dog walking services. Using the beach and reserves for walks, we give your dog the chance to interact with other dogs and the daily exercise that it needs. We truly believe that we offer the best possible service for your dog at the most affordable price. We walk no more than 4 client’s dogs at one time in our group walks, and they are all fully insured, trained professional handlers. This ensures that your dog will be in the most capable of hands on or off the lead if requested, running and playing with their other four legged friends. All of our clients comment on how happy their dog is after their daily walk and how exhausted! All of our dog walkers are experienced in dog training, local to your area, dedicated to their jobs and reliable. We are experienced and share a love of all things doggy, on our walks we even practice training such as loose lead walking and recall. Take a look at our competitors, compare their experience and training - then come back here and use the best! In addition to our Gold Coast Dog Walking Service, we also offer Pet Sitting and Feeding services at your home. Call us on 0426 519 505 for more details. 60 minute walk - $28.00 + $10.00 per dog from same household. 60 minute walk - $44.00 + $15.00 per dog from same household. Discounts apply to those who have participated in any of our dog training services. Servicing South Gold Coast, Burleigh Heads to Main Beach and surrounds. Robina, Mermaid Waters, Broadbeach Waters, Cararra, Nerang and Worongary and surrounds. Group walks every day of the week. Gold Coast Socialisation Dog Walk. Does your dog need socialising? Do you want to meet up with other dog walkers? Make new friends for you and your pooch? Are you afraid of dog parks and the bad reputation they bring but still want to safely walk your dog? 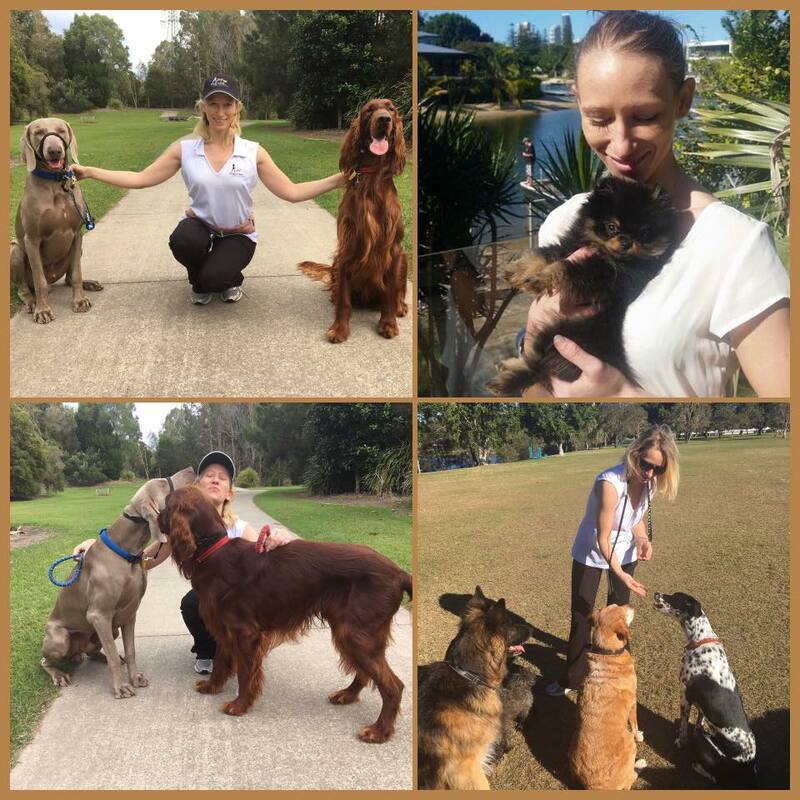 Now you can with Gold Coast Dog Trainers organised group dog walking. We all meet up at the doggy park and go for a 1 hour structured group walk on lead. Once you have been integrated into our pack, off lead and play time for the doggy's is also an option. We will guide you with loose lead walking, recall, socialise your dog with others and teach your dog manners when in a social setting. We will teach you acceptable doggy behaviour so all dogs are welcome from Chihuahua to Great Dane to learn to walk and play safely together. This is not for dog aggressive dogs. Please contact us for dog aggression issues. Every Tuesday in Carrara at 09.30 hours. Wednesday in Broadbeach Waters at 09.30 hours. Tuesday: Boonooroo Park, Hickey Way, Carrarra. Wednesday: Albert Park (Rialto Park) Corner Monaco St and Fremar St, Broadbeach Waters. TBA: Pizzey Park, Pizzey Drive, (Off Oceanic Drive) Miami 4220. Please use the contact form below to express your interest. Limited Numbers.